It’s safe to say that every first apartment kitchen needs an Instant Pot. The Instant Pot Duo Plus 60 is a six-quart device that replaces nine kitchen appliances (saving all-important space in those small cabinets). It’s a pressure cooker, a slow cooker, a rice cooker, a yogurt maker and an egg cooker. It can also sauté, steam, warm and even sterilize all with the push of a button. Perfect for the new college grad who doesn't have the time to slave over a hot stove, an Instant Pot can cook an entire dinner in a single pan, reducing the need for endless dirty dishes or multiple stove burners firing away. Each set comes with a steam rack, recipe booklet, serving spoon, soup spoon, and measuring cup. Help your college grad ease into adulthood with a kitchen device that will make cooking a breeze. The Instant Pot is consistently one of the highest-rated cooking products online, and we’re sure your loved one will echo the same enthusiasm. Just because they have a college education doesn't mean they know all the in's and outs of the "real world." This book will give them 468 tips to help get through life with the facts and advice they need to be an adult. Stuff like what to look for when renting a new apartment, how to find a mechanic, how to fix a toilet or how to act at work. All of the information is very useful for people in their young 20s who are just entering really living on their own. Young people found this book useful while people who gave this book as a gift found themselves reading the whole book themselves to see all of the tips they had. Now that your graduate is trading the classroom for the meeting room, it’s time to invest in an adult wallet. A beautiful leather wallet will last your friend or family member for years to come, and it’s always a great choice for a graduation gift. The Bosca ID Passcase Wallet is a sleek, gorgeous accessory perfect for any guy preparing to navigate the real world. It comes in amber, black, cognac and brown, and is made from real leather. It has eight credit card pockets and a removable ID case (so no more fumbling to get a driver’s license out). Reviewers say the Bosca wallet will last long past his next big milestone; owners rave about the beauty and design of the piece, stating that it’s sleek enough for slim-fitting pant pockets. If you’re looking for a high-end gift to show him how proud you are of his achievement, a luxury wallet is a great way to go. Help her on her journey from entry-level to CEO with a business card holder that she can keep on her desk or in her bag. The Kate Spade "Let's Do Lunch" Business Card Holder is silver-plated and measures is 3.5 inches wide, which fits most standard business cards. It’s engraved with the phrase "let's do lunch," which is both cute and playful. Pair this chic business card holder with a gift card to her favorite work-friendly clothing store for a gift that is both useful and fun. 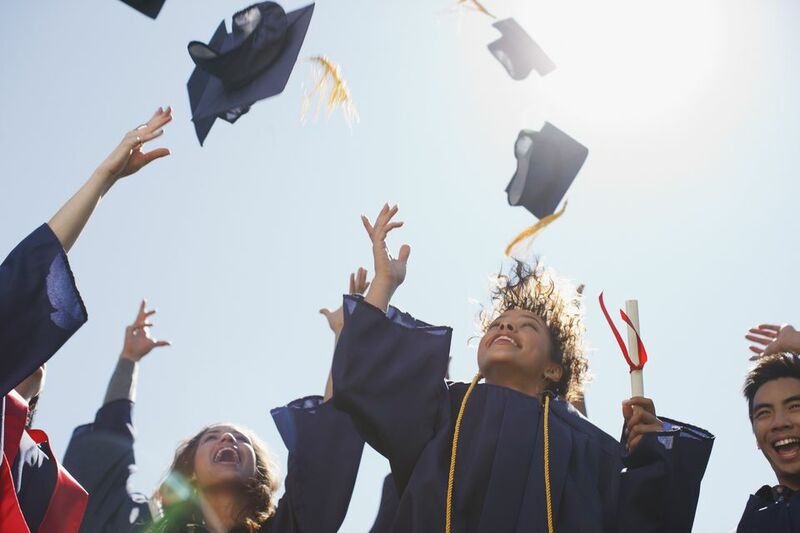 College graduation is a momentous time in a young adult’s life. If your child is picking up his or her diploma with the class of 2019, it’s entirely appropriate (and incredibly appreciated) to gift money. We recommend anywhere between $100 to $500 for a new college grad, but whatever you and your family find acceptable will be received with gratitude. If you want to give him or her a gift to open, pair a check with a small gift like the Thermos Stainless King 40 Ounce Bottle. At just around $30, it won’t break the bank, but it will be used again and again (especially as your son or daughter gets used to those early meeting wake up calls). It comes in red, black, blue and stainless steel, and holds 40 ounces of caffeine. It can keep liquids hot or cold for 24 hours, which is a convenient feature. Any gift idea can pair well with a check (no one returns money! ), but a small and useful item is a great gesture to pair with a monetary gift. At this point, their college laptop will likely still suit them for a few more years, but the Apple Watch Series 3 will help your grad take their organization and health to the next level. This smartwatch is a great way to help them schedule meetings, reply to emails and (most importantly) remember to call Mom. The simple white sports band is a great unisex option and is versatile enough for both work and play. It will also encourage him or her to stay active, with built-in step and activity trackers plus an optical heart sensor. It can be paired with compatible gym equipment and it has a water resistance rating of 50 meters, which means that it can be used for water-based workouts like swimming. Worried about the battery life? It lasts up to 18 hours on a single charge. While this watch might be at the higher end of your budget, the high-tech features and modern look make this gift a keeper. Graduating from college often means leaving for a new home in a new place. Whether it’s an exciting job offer across the country, a trek around Europe, or an opportunity to move back to a welcoming hometown, a recent college grad can expect to do a fair amount of traveling. Get them excited for all of their upcoming adventures with a new Herschel Supply Co. Novel Duffle Bag. It’s available in endless colors and designs and it's the perfect accessory for a road trip or flight. It measures 15.5" high and 20.5" wide, and includes a shoulder strap as well as a handle. Plus, the shoe compartment that divides clean clothes from dirty shoes is a great functional element. Herschel products are made of high-quality woven fabric and come with a lifetime warranty against common wear and tear. If your college grad is setting off on a new adventure, a travel bag is a practical gift that won’t go unused. There's nothing more important to a recent grad than capturing those perfect moments with friends while traveling and beginning their new life as an adult. The Nikon D3400 takes crisp, clean photos thanks to the EXPEED 4 image processing engine and an ISO range of 100-25,600. Portrait shots will appear lifelike with perfectly blurred backgrounds, and low-light shooting is impressive—to say the least. If your grad plans on doing a lot of traveling, this camera is lightweight and compact (it weighs under a pound) so it will easily fit in a travel bag or backpack. Most importantly, the built-in SnapBridge Bluetooth Connectivity allows for easy sharing on social media platforms. Photos will automatically appear on their phone and can be stored in the cloud on Nikon Image Space. This app also lets them create, edit, and share photo albums. Even if your grad has never owned a DSLR camera before, the auto-focus feature, intuitive controls, and handy applications make this camera easy to use. The end of college means the end of an era, but that doesn’t mean the end of a true friendship. If you want to celebrate those four incredibly meaningful years with your best friend, son, daughter, or grandchild, the BarnwoodUSA Reclaimed Wood Signature Picture Frame is a sentimental and beautiful gift that he or she will always treasure. Dig through social media or old albums to find that favorite photo of yours, and display it with a frame that will look great in a new apartment. The BarnwoodUSA frame comes in 15 different sizes, but we recommend 8x10 or 5x7 to display a portrait or a candid. It’s made from 100% recycled wood. Send your graduate off into a brave new world with a gift that allows him or her to always keep you close by (even if they're only moving down the block). If you're looking for a practical gift that your grad will use every day, the Keurig K-Elite Single Serve K-Cup Coffee Maker is the way to go. With the Keurig, they’ll be able to hop out of bed and enjoy a steaming cup of joe in a matter of seconds. There's also a hot water button that they can use for oatmeal or instant soups. Best of all, this coffee maker is fully customizable—K-Cup Pods come in four sizes, and you can increase the strength and flavor of your coffee or even drink it iced. The Keurig K-Elite Coffee Maker comes with a 6-count K-Cup Pod variety pack, one water filter handle, and one filter. Also, the water reservoir allows you to brew eight cups before refilling. Now that's caffeine made easy! For the bestie who has it all, the Mpow H5 Active Noise Cancelling Headphones make for a great gift. Not only will these headphones effectively block out any surrounding noise (perfect for long commutes and traveling), but they’ll also make their music sound roughly 100 times better than it used to be—these headphones are specifically designed to give you the best auditory experience possible. They’re also supremely comfortable, thanks to the adjustable, foldable headband and protein earbuds. Bluetooth 4.1 connects in mere seconds from up to 33 feet away, and the built-in battery works for well over 25 hours. Your best friend will never guess that these awesome headphones cost under $50. These headphones will work with Android and iOS smartphones and tablets, as well as MP3s, iPods, your PC or TV, and other Bluetooth-enabled devices.